The reason why we share with you unreasonably expensive shoes, it is because we are often stunned by the creativity of the product we show. 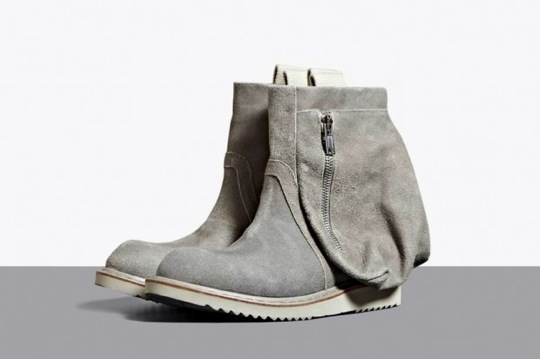 Though the com aspect of things seems a little naïve when it Rick Owens for exemple expects us to actually use a $1,620 USD pair of shoes in the desert, his Desert Engineer Boots from his Spring/Summer 2012 collection,constructed from 100% leather bound to rubber composite soles are just amazing to look at. With a zippered stash pouch on the exterior of each upper you’ll be able to find them through LN-CC in London.